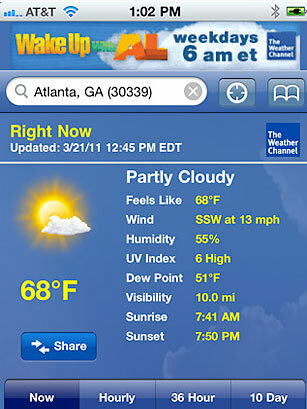 The sheer number of weather apps is intimidating, but the Weather Channel has its own, you know, TV channel. And while the Weather Channel app may be well known because of its cable parent, it's a good one to keep at the ready whether you're heading to another time zone or you're just going to the game. Using your phone's GPS chip, it'll show you what Mother Nature is up to where you are, complete with radar maps, severe-weather alerts and 10-day forecasts. If you're an Android user, you can even set up an automatically updating weather widget on your phone's home screen.